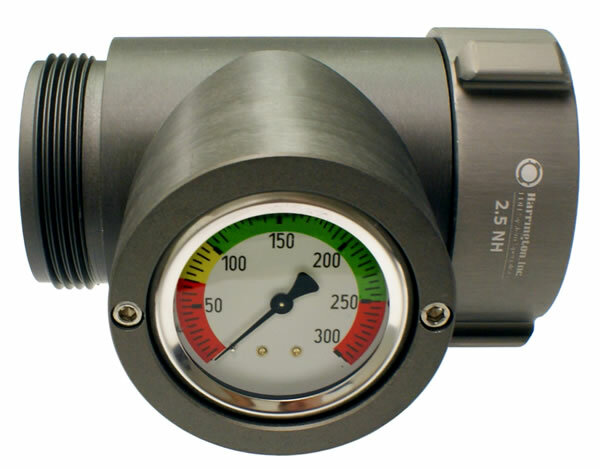 1.5″ and 2.5″ in-line pressure gauge. Excellent device for determining pressure in standpipe for high rise attack lines. 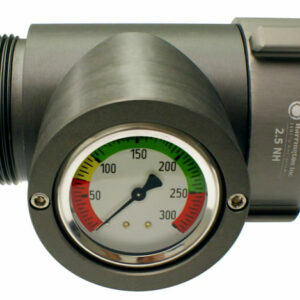 Protected gauge model has “lumi- nescent”, glycerin filled, 300 PSI easy to read gauge. Bodies are hard coated anodized 6061-T lightweight aluminum. In-Line Gauge, Length: 7” max., Width: 6.5 max., Weight: 5 lbs. max. Most Items Ship in 3 – 5 Days! Need A Quick Shipping Quote? Interested in ordering a product? Click HERE to search for a replacement part. "A good day hence forth is spelled: H A R R I N G T O N"
A worldwide supplier of high precision water delivery equipment for the fire and fracking industry. Harrington provides V-Groove couplings, LDH Appliances, Storz adapters, fracking hose couplings and AWG Fittings for water delivery systems. As a privately owned family business, our main goal is to provide our customers with products that meet and exceed their specifications and to provide superior service.